I gave this book 5 stars. It was, mind blowing to say the least. I think it was written incredibly well. It told the story of a girl who just anted to live. It was adventurous, and fulfilling. I have a love-hate relationship with Paige. She was just terrible to Flora at first. I mean, Flora was drugged up and had really bad amnesia, she kissed Paige's ex boyfriend, not even her boyfriend, and Paige just got so mad about that. She decided that just because her feelings were hurt she was going to leave her best friend pretty much helpless and alone. She backed out of the agreement, without even telling Flora's parents, she told her amnesic friend who wouldn't remember she said that. She called maybe once or twice to make sure she wasn't dead yet, but she didn't take care of Flora when she needed it. Flora didn't even eat for several days because she forgot to. Then she went off to the North Pole because of a boy, and Paige ran into her and didn't even stop her! I was just so mad about all of this. What redeemed her a bit to me was when at the end she helped Flora by switching out the tranquilizers with sugar pills so that Flora could be herself. She turned it around and decided she needed to help her best friend. Drake is a whole other story, he was probably the opposite of Paige. We had this pretty image of him. He was going to save her, and sweep her off her feet. He would love her even though she couldn't function all that well. he turned out to be a raging douchebag. He tried to make Flora think that he had never kissed her on that beach and that she was just a deluded stalker. I mean, she was a bit deluded because she wrote emails from him to her, but him kissing her in the beginning was what started it all. I loved how the author did that, she flipped stereotypes on their heads. The boy wasn't there to save the girl, it was what we thought he was there for, but he was really there to show us that we didn't really need him, in fact he made things a bit worse. Well, I guess the adventure was actually really good for Flora, but everything else was awful. I was so sad about Jacob. He seemed to be the one person Flora had that would always be there for her. It was just so sad that he had to die. he had faced death before and won, but he had to lose it again at such a young age. Jacob was a good brother, I really wish we could have seen more of him, but I understand why we didn't. My favourite part actually included him. Or I guess, my favourite line included him. I just loved how he described himself as a "Grumpy, gay seventeen year old" I don't know why I enjoyed that as much as I did, and I don't know why the author included that, I'm just really glad that she did. Her mother is a bit psycho. I know she means well, but she is smothering Flora. Keeping her on antidepressants and tranquilizers, also keeping that neurosurgeon away from her event hough he could help her. Flora's mother needs to get some help. Her father is a great guy though, I like him. I loved the style of the writing. It felt like it was truly written by someone in that situation. I just can't get over it. I wish that there was maybe a follow up book or something. 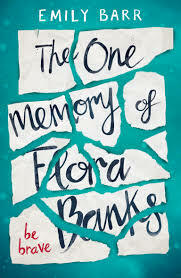 I want to know what happens to Flora! Anyway, I think this book is a must read for everyone. I don't have any quotes for this one because I got an arc of this despite only reading it on it's release date.